If your child has medical issues or dietary restrictions, proper care while they are with the other parent is a big concern for many parents. These tips on handling child health issues after divorce can make your life easier. If your child has dietary restrictions, you probably work overtime to make sure nothing passes your child's lips that could harm him or her. If you have a child who needs regular medication or medical monitoring you also spend a lot of time keeping things running. 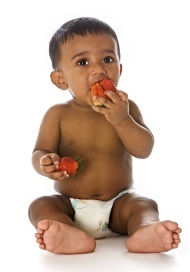 You might also be a parent who firmly believes in organic foods for your child. All of these situations required a lot of education and time on your part to create a healthy life for your child. What do you do if your ex is not on board with the plan? I've heard from lots of parents who are struggling with an ex who will not support or participate in healthy lifestyle choices (or requirements) put in place for their children. The first thing you should do if you're in a situation where your ex will not cooperate is really talk with him about it. And I when I say talk, I mean have a calm, two-way conversation. This is not a chance for you to lecture. Find out what objections or problems your ex really has about this - you can't solve anything if you don't understand the problem. In many cases, the other parent doesn't fully understand the repercussions of not sticking with the plan (such as the parent who sort of understands celiac disease enough to buy rice cereal, but not enough to read the label to see that the product also contains wheat). If you're dealing with a situation where you've made a choice that is not dictated by a doctor (such as a decision to go organic), your ex might not think it's important enough to comply or think it's just a whacko thing you've come up with. Once you've pinpointed what the problem is, you can work on educating your ex. If you're dealing with child health issues, ask your ex to meet with your child's doctor so he can hear it from the horse's mouth. Print out a few (not a giant stack) articles from the Internet that clearly spell out the issues and how to deal with them. Then talk to your ex about what you do in your home to keep your child healthy and ask what you can do to help him do the same. Would it help for you to suggest a few foods he can safely make without too much trouble? Could you suggest some restaurants that have foods on the menu that are safe? Would it help to give him a written medication schedule with times and doses spelled out? If you're dealing with something that is optional, like an organic diet, you'll have to be the primary educator. Talk with your ex about why you think this is best for your child and what the concerns really are. Point out how easy it really is to use organic foods and explain how accessible they are. Organic diets are no longer a fringe concept and if you can help your ex understand how mainstream this really is, it may seem more appealing. How do you know if your ex is following through? With very small children, you won't unless there is a medical indication. Nagging isn't the answer, although helpful follow up can really work. Offer to take his sharps container for disposal when you take yours. Ask if he's having trouble finding things to pack in the school lunch that meet the dietary requirements. Ask if he has any questions or concerns you could help with. If you have an older child, you'll probably get feedback directly from your child, and if you've taught your child to be a self-advocate, he might very well be telling Daddy he doesn't want to eat the cookies because he knows they will hurt his tummy. If you're not getting feedback, ask a few well-crafted questions of your child. You don't want to be an interrogator who pits your child against your ex. You also don't want to make your child feel he is at fault for eating what the other parent has served. Instead, casually find out what he had for dinner or where they went for lunch. Don't comment, just listen. Gather information without reaction. Let's be honest about this situation. There are some exes who are going to see this as just another way for you to try to exert control over him - another way to tell him how to run his life and another way to criticize his parenting. His response might be to decide not to participate at all or to actively thwart the plan. If you're dealing with a medical diagnosis that necessitates a specific diet, certain monitoring, or prescribed medication and your ex is not complying, your recourse is to go to court, because you need to protect your child's health. If your child is not receiving the medical care that is necessary, you need a judge to order your ex to comply or to lose his visitation. Supervised visitation is an option in these situations. Some parents will not comply until a court forces them to become educated - for example, by going to a class about diabetic diets. The idea of losing visitation can be enough to get unwilling parents to suddenly comply. If you're in a situation where you do not have a doctor specifically prescribing the diet (such an organic diet, or even a diet that simply excludes sodas and candy) you've got a tougher row to hoe. It's not a bad idea to see if you can get your child's doctor to agree to testify about how the plan you have is healthier for your child and non-compliance by your spouse is detrimental to your child. It's possible the judge could order your spouse to follow the plan or face a loss or reduction in visitation. Educate your child, so she can make healthy choices when with your ex. Feed your child before he goes on visitation, so that you know he at least got one healthy meal and won't want to eat much for a few hours. Pack some healthy snacks in your child's bag. If his favorite raisins are in the bag he might be less likely to eat potato chips. Send leftovers. If you made a big pan of lasagna with healthy ingredients, give some to your ex casually. Don't say "Feed him this instead of that junk you have!" Say "I had lots of this leftover and thought you could use it at your house." Creating a healthy life for your child takes two parents who are able to cooperate and focus on the fact that what is best for your child must come first.